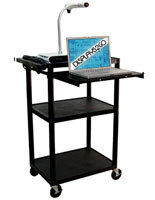 Is your school or business in need of AV carts that will easily transport multimedia presentation tools? 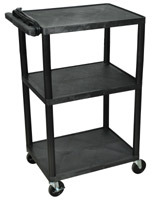 These media trolleys for classrooms are loaded with many usability features to make them a great addition to any organization, business, or facility. 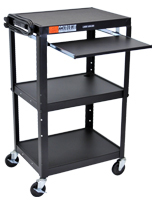 These mobile utility stands are a perfect choice for moving projectors or laptops or to hold equipment for showing videos to classes, presentations, and audiences. 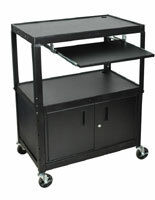 Commercial grade AV carts, called multi media equipment trolleys, are made of materials that are meant to last, like steel and heavy-duty plastic. Many models include a powder-coat finish that will help to keep the office furniture looking great for a longer period of time. 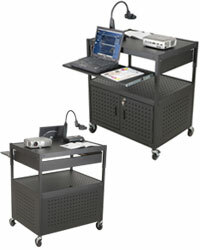 These portable AV carts for business and educational use offer multiple shelves, providing plenty of storage space for audio visual equipment, presentation accessories, electronics or even supplies. 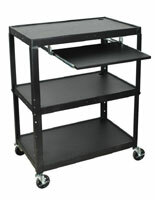 Many of these metal and plastic media trolleys are height adjustable to accommodate the widest variety of electronics, multimedia players and other audio visual fixtures. 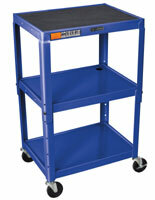 Lockable wheels allow the portable fixtures to provide maximum stability during use to protect valuable equipment. 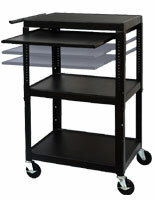 What other special features are available with these multi media equipment trolleys? 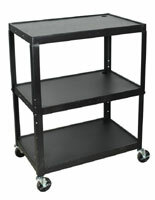 AV carts ventilation holes help to prevent audio visual equipment stored inside from overheating and others have cable pass through holes to keep stands neat and tidy. 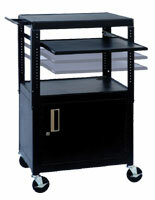 Several portable equipment trolleys feature locking cabinets on lower shelves or drawers on an upper shelf to prevent important items, like instruction manuals or remote controls, from being lost or stolen. 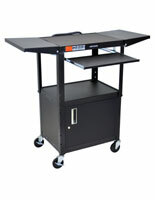 This option is ideal for hectic classroom environments. 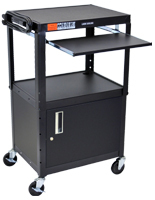 Many of these mobile multimedia presentation units are sold with different options for shelves, whether that is adjustable heights, front pull out , side pull out, or both front and side pull out. Some of the levels are even outfitted with mats to prevent the sliding of equipment during movement. 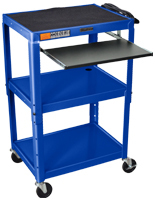 This type of portable office furniture with all of its great features, like secure cabinets, adjustable shelving, and sturdy locking wheels, is typically seen used in schools, businesses, and churches, just to name a few settings. 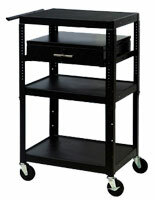 Really any company, even retail locations, which needs to show multimedia presentations videos to customers or employees, will find these carts useful. 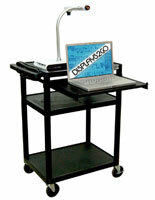 Portable AV furniture is ideal for all levels of school from elementary up through college. 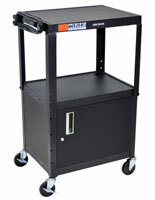 Because teachers don’t always teach in the same classroom, it is important for them to have a mobile cart that is able to quickly transport their laptop, projector, and other audio visual equipment from one place to another. 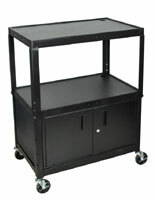 This is when locking casters, cabinets, and durable steel and plastic construction is important as well because kids, even adults, may not always care that the stand is someone else’s property. 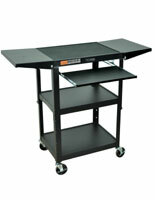 These pushcarts work the well for office life as well. 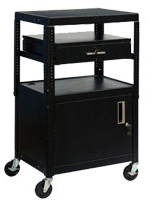 Even if there is only one conference room in your company, these handcarts save time by having the proper equipment already in place and ready to use allowing presentations to start quicker. 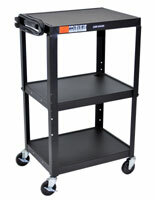 A portable utility cart is also easier to put back into storage when its multimedia equipment is no longer needed. Mobile projector or video stands are also ideal for churches that might need to show a movie to their youth group and then set up the same AV furniture for use in another room for Sunday School.